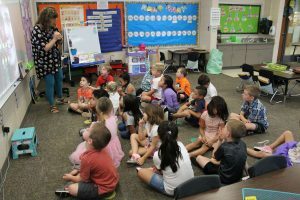 Yesterday we got the chance to see some of the youngest learners at GCS in action by visiting two kindergarten classes at Model Elementary. During the morning announcements, Model principal Tami Hicks led the Pledge of Allegiance, previewed the lunch menu and the next morning’s breakfast menu, told them what weather they could expect at recess, shared the names of students who had birthdays, spoke about Model’s current all-school initiative “21 days of Kindness”, and then thanked students for using their Bulldog Beliefs: Respect, Responsibility, Safety, and Kindness. 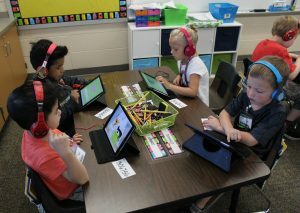 The students then talked about what they did over the Labor Day weekend. 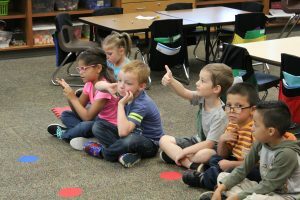 Mrs. Hochstetler asked them things like “did you sleep in, did you play outside, did you go to a lake or a pool?”, and other questions that the students responded to by giving the “thumbs up” signal. 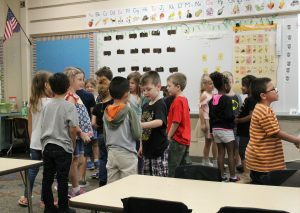 Next, Mrs. Hochstetler talked about how students should politely greet each other “since we are still learning names”. 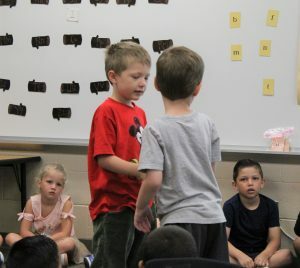 “By greeting others, we are showing kindness. You should shake hands (but not too hard, we do not want to hurt our friends! ), look people in the eye when you talk to them, smile, and say your name. 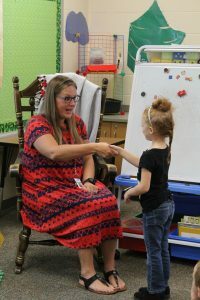 Say, good morning, my name is Mrs. Hochstetler, it is good to see you.” She had a couple of students demonstrate, and then she had the whole class practice. 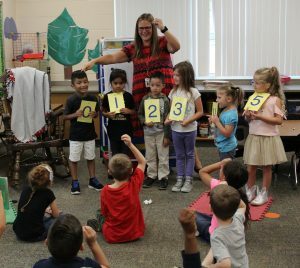 Then Mrs. Hochstetler reviewed the day’s schedule, so that everyone would know what to expect. 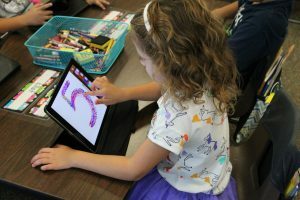 While doing so, she explained what they would do, and what the different sections of the schedule meant. 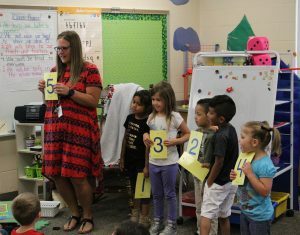 For the math section, Mrs. Hochstetler shared the number 5, and related it to the very first thing of their morning. “Remember when you came in this morning? I said, give me five and we slapped our hands together. Look at my hand when I do that, I have five fingers out. 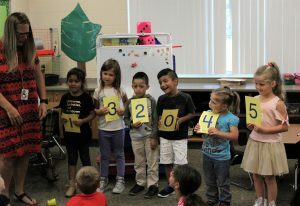 That is what we mean when we say give me five.” They spent some time talking about the numbers before five, 0, 1, 2, 3, and 4, and then used a few games/exercises to help them all get the number 5 firmly planted in their brains. 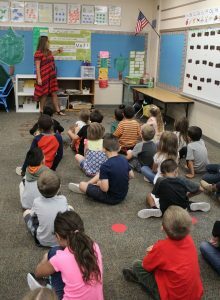 Another white board in Mrs. Hochstetler’s class held their Class Promise for their room/class: We keep our bodies to ourselves; We will raise our hand to share our ideas; We will listen to our friends and teachers; We will be kind to everyone; and We will be safe in the whole school. 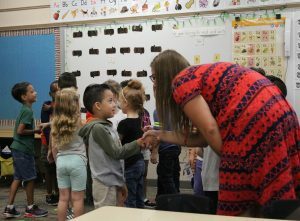 For some kindergarten students, especially if they did not attend pre-K or nursery school, this new class may be their first experience with school. 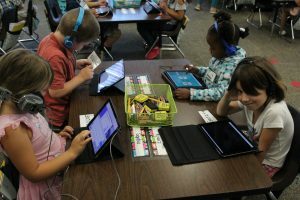 They need to learn the ways to be in school, how to do school, and how to function as part of a small class/community; that is part of the instruction of kindergarten. 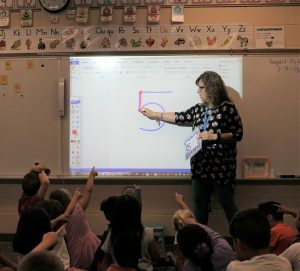 Mrs. Stockman then introduced the class to the number 5. 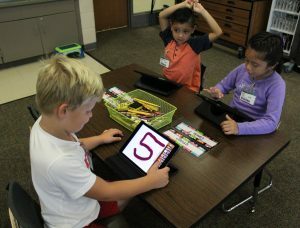 After explaining each step they should take to correctly draw the number five, she asked them to practice with their iPads. 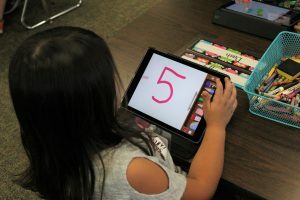 “You will count to five, read it, write it, and say it. Your goal for this week is to learn the number five. 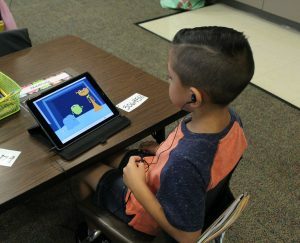 If you need help, please raise your hand.” Then the students took turns getting their iPads from the cart and returned to their seats to practice. 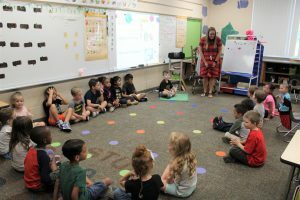 One thing that was noticed in both classrooms was how much the teachers were talking to the children throughout all of the class activities. 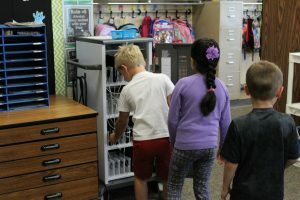 Sometimes they were redirecting a student, but more often they were explaining things, praising a child for doing the right thing, recognizing when someone learned a new concept, acknowledging that students were following directions, or thanking them for their good manners or showing kindness to others. Anyway, it was noticed that kindergarten teachers are very busy! 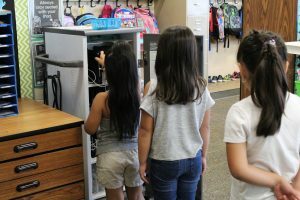 The other thing that was noticed; some of the children are still getting used to an early morning routine. 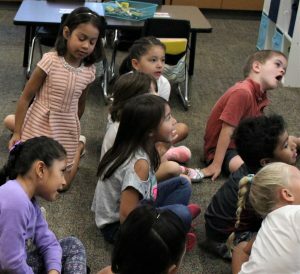 There were quite a few yawns in both classes and we captured just a few of them, which were adorable! 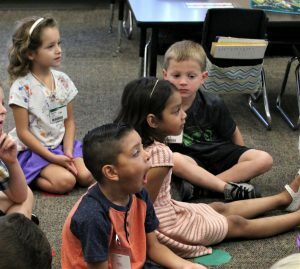 Mrs. Stockman said that during the first few days of school, she had a student fall asleep during a discussion at the end of the day and stay sleeping while the rest of the class packed up all of their belongings! 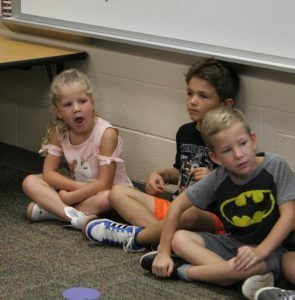 Thank you, Mrs. Hochstetler, Mrs. Stockman, and Model kindergartners, for helping us learn more about what students are doing and learning when they first come to GCS. 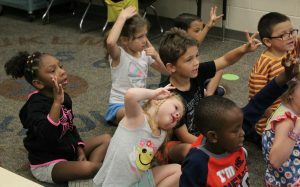 We can’t wait to see you grow and progress over the years! !